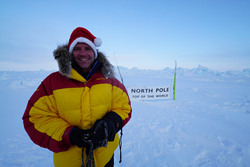 His visit to the North Pole was comprised of skiing and sledge hauling, while battling temps of 80 below zero, and concluded with Swarner mounting the Flag of Hope at the top of the Pole with the purpose of encouraging those fighting cancer, as well as survivors and caregivers, to overcome their own extreme challenges. The effort also raised over $30,000 for cancer research and programs to benefit patients, survivors and their families. While Swarner has completed the grueling expedition, donations can still be made and will be given to various philanthropic charities, including the CancerClimber Association. The CancerClimber Association’s objective is to give other survivors the opportunity to live adventurously and instill hope within the cancer community. Swarner’s expedition sponsors included LIVESTRONG, F Cancer, Anti-Cancer Club, St. Baldrick’s Foundation and Tissot. Swarner, who had previously been given a prognosis of just fourteen days to live and endured a medically-induced coma for almost a full year, has only one functioning lung as a result of radiation therapy, making his athletic achievements, like completing the Hawaii Ironman, even more incredible. To learn more about Sean Swarner’s mission or to get involved email missionofhope(at)digitalbrinq.com. Join Sean Swarner on his continuous journey of hope, and follow him at http://www.seanswarner.com/missionofhope and on Facebook, Instagram, and Twitter. Sean Swarner is unstoppable. More than just a two-time cancer survivor, he is also an author, inspirational speaker and co-founder of The CancerClimber Association. Voted one of the top eight most inspirational people of all time, Sean was the first cancer survivor to summit Mount Everest. Today, he offers hope through inspiration to cancer patients and survivors alike by focusing on living an active, healthy lifestyle. Sean’s first book “Keep Climbing” has inspired many to reach their peaks of success. He is currently promoting the release of his new e-book series, “7 Summits To Success.” For more about Sean, visit http://www.seanswarner.com.